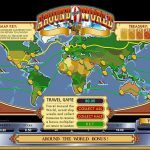 Around the World is an older Microgaming slot which takes you an adventure to all the world continents. The slot is designed like a real slot machine which offers the players a real live casino experience. The animations and visual detail in the slot are on a low level, but the symbols are well designed giving the slot an attractive look. 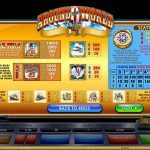 With an interesting set of bonus features and a 10.000 coins jackpot payout Around The World is sure to catch the attention of all players who enjoy playing vintage looking slots. This slot has two wild symbols. One is a regular wild, while the other is a x2 wild which doubles any payout he contributes in. Both wilds will replace all of the game symbols except the Scatter Compass and the Globe Bonus symbol. manage to land 5 scatters you can get up to a 32 x win multiplier. The Globe Bonus symbol will trigger the Travel Bonus Game. You will need to land 3, 4 or 5 Bonus symbols on a winning pay line in order to trigger the feature. Here you will need to choose one of four world routes. Collect treasures along the way, accumulate multipliers up to x4 and avoid the shipwrecks in order to keep your winnings. 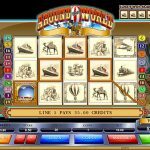 Despite the vintage design Around The World is still an interesting slot game. The Microgaming designers put in a lot of work into the game to make it appealing to players. The game has interesting bonus features which can produce nice payouts, despite the lack of a classic free spins bonus. For all of you fans of the winter… you should consider playing Arctic Fortune a 5 reel slot by MicroGaming.